Supreme command: soldiers, statesmen, and leadership in wartime. · One Book. One Author. One Hour. Front and back endpapers contain characterizations of Winston Churchill, Georges Clemenceau, David Ben-Gurion and Abraham Lincoln as statesmen as well as some biographical information on each man. Churchill failed as a war strategist according to his generals; he admired many military leaders but was unwilling to accept their suggestions on faith; he picked commanders who disagreed with him; he had the power of intelligent questioning based on wide reading and common sense. Clemenceau believed war was too important to be left to the generals; he made weekly visits to the front lines; he was a radical socialist and anti-Catholic. Ben-Gurion admired Lincoln, Gandhi and Moses. He grew disillusioned with communism, fought with the British in WWI and admired Russian socialism. He ordered commanders to defend every community, while he focused on Jerusalem. In 1953 he developed a new long-term plan: 1) Foreign reliance with France, 2) nuclear weapons, 3) deferring large military acquisitions in favor of absorbing more Jews into Israel. In his view the most dangerous enemy was the intellectual inertia of those responsible for security. Abraham Lincoln controlled his generals; he was an unforgiving boss. Based on Lincoln's five propositions, Grant acted with a fundamental understanding of what Lincoln wanted. Lincoln felt he had to master the details of war; he had an understanding of the interplay of war and politics - this made him the greatest American commander in chief. Notes on the qualities which these four leaders share, state: They have intuition and genius; they comprehend a multiplicity of forces and conditions; they each have the quality to persist; they have courage and are willing and able to dismiss their generals. All four are well read in history, politics, and literature and have mastered the art of speech and writing. All had moderation and could also be ruthless. Each had a deep streak of the willingness to do terrible things. Other notes contrast this scenario with Vietnam: "Fault in Vietnam was a deadly combination of inept strategy and excessively weak civilian control. LBJ picked weak leaders." -- Annotations by Brian Lamb in the margins and underlining of pertinent phrases throughout the book. 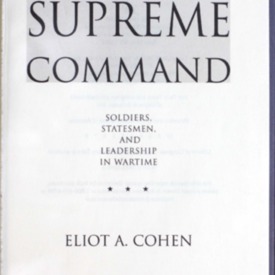 Cohen, Eliot A, “Supreme command: soldiers, statesmen, and leadership in wartime.,” One Book. One Author. One Hour., accessed April 24, 2019, http://booknotes.gmu.edu/items/show/739. The relationship between military leaders and political leaders has always been a complicated one, especially in times of war. When the chips are down, who should run the show--the politicians or the generals? In Supreme command, Eliot Cohen examines four great democratic war statesmen--Abraham Lincoln, Georges Clemenceau, Winston Churchill, and David Ben-Gurion--to reveal the surprising answer: the politicians. Lincoln, Clemenceau, Churchill, and Ben-Gurion led four very different kinds of democracy, under the most difficult circumstances imaginable. They came from four very different backgrounds-backwoods lawyer, dueling French doctor, rogue aristocrat, and impoverished Jewish socialist. Each exhibited mastery of detail and fascination with technology. All four were great learners, who studied war as if it were their own profession, and in many ways mastered it as well as did their generals. All found themselves locked in conflict with military men and all four triumphed. The art of a great leader is to push his subordinates to achieve great things. The lessons of the book apply not just to President Bush and other world leaders in the war on terrorism, but to anyone who faces extreme adversity at the head of a free organization--including leaders and managers throughout the corporate world. "Civil supremacy over the military--Case studies."